So the first official weekend of fall lead to what we called football weather and it turned some things upside down. 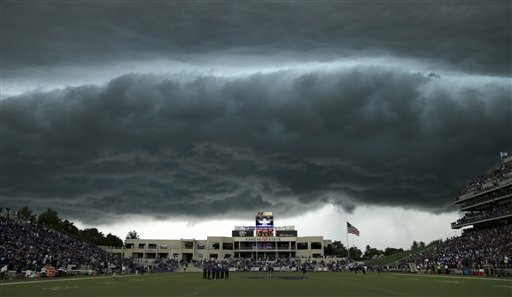 The Central Florida at Kansas State game was delayed for one hour and a half. Baylor also had to sit through a delay. Now on the field, the Texas loss to UCLA also turned some heads as lighting struck 3 times in a row for the Bruins. Yup, UCLA beat Texas the last 3 times they played each other. Now, there were the typical blow outs but we are about to head into Week 5 and it will get even messier. Let’s check out how the Pick It and Stick it played out first. So Snyder in Syder made the jump by winning out the week. He had number 1 in points. Meanwhile at the caboose, the Joose is coming on strong after completely missing the first week of pics. Krizzou better watch out for the Josse Train. Sonny Boy Sweetcakes, Huskers All the Way, and Krizzou had a throw away week. Everyone else gained ground. We’ll find out who makes the jump next week as we got a great slate of games coming up.